A feature article in the New York Times suggests NAFTA is far from critical to Canada’s economic survival and even if “what would succeed it is not clear”, Susan Yurkovich (BC Lumber Trade Council) doesn’t anticipate access to US markets to be significantly affected. In other Business news: more on the NDP’s plan to restore appurtenancy rules that tie timber harvests to mills; Oregon wood products show job growth; and forest fires in Canada contribute to Taiwan’s toilet paper panic. At the BC Forest Professionals AGM, Minister Donaldson announced a review of the province’s Forest Inventory Program and expressed gratitude there was no loss of life associated to the 2017 wildfire season, while Environment Minister Heyman said forestry is not the primary reason for a review of the role of professionals in resource management. In other news: prefabricated mass timber offers ‘plug and play’ construction; McDonalds is under pressure to go 100 per cent biodebradable with packaging; and beech trees are booming due to climate change and “that’s bad for forests“. Closing the three-day conference of the BC Association of Forest Professionals in Victoria, Doug Donaldson, Minister of Forests, Lands, Natural Resource Operations and Rural Development, provided an overview of his government’s forest policy directions. This includes increasing jobs per m3 harvested, expanding BC’s innovating wood-products sector, and improving wildlife management and land use planning. Although future actions related to how the province addresses wildfires will await the Chapman/Abbott review in April, the Minister expressed thanks and gratitude to all who helped ensure the 2017 wildfire season came and went without any loss of life. In response to wildfires and the mountain pine beetle epidemic, Donaldson announced the formation of a five-member panel to review the province’s forest inventory program. The panel includes: former UBC Forestry Dean Clarke Binkley; RPFs Bill Bourgeois, Valerie LeMay and Ian Moss; and Nick Reynolds of Sangan Environmental Services. The objective is to ensure the program accurately reflects the changed nature of BC’s forests. Speaking at the Association of BC Forest Professionals AGM in Victoria on Friday, George Heyman, Minister of Environment and Climate Change Strategy said “ensuring the public interest and the environment are protected” is behind the government’s review of the role of professionals in resource management. Citing the Mount Polly mine disaster and the Hullcar Aquifer [agriculture] situation as incidents that have created “public doubt”, Heyman added that the review is “not directed at professionals per se, but whether the system under which they operate is functioning properly”. Although forestry was not the reason for the review Heyman noted that “all professions need to be included because there are inconsistencies across the associations” and “system challenges have been identified by the Forest Practices Board” in the practice of professional forestry. Quoting the Board, Heyman mentioned situations “where forestry development has put environmental and community values at risk, yet district managers could do little to protect the public interest”; and “where multiple licensees operating on the same landbase may [unwittingly] undermined each other’s action to protect a non-timber value”. 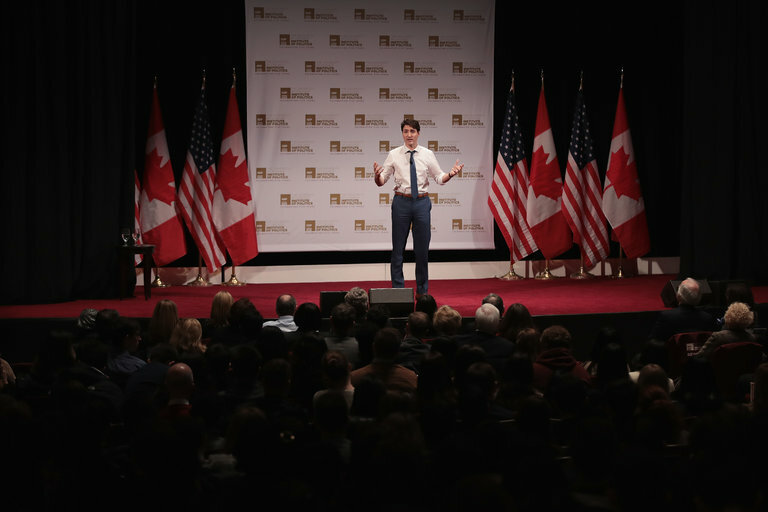 OTTAWA — Nothing has reshaped Canada’s modern economy more than free trade with the United States. But that doesn’t mean the country is staring at economic ruin if the current negotiations over the future of the North American Free Trade Agreement collapse, and the agreement is scrapped. … But some major Canadian industries have weaned themselves off a near-total reliance on Nafta markets for their exports. British Columbia once sent nearly all of its softwood lumber exports to the United States. Now, the United States accounts for about 49 percent of that industry’s 5 billion Canadian dollar export business, with 26 percent of sales going to China and 16 percent to Japan. Even if Nafta disappears, Susan Yurkovich, the president of the B.C. Lumber Trade Council, said she doesn’t anticipate that access to the United States would be significantly affected, even if what would succeed it is not clear. 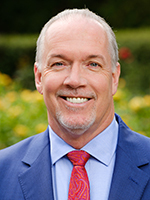 The BC NDP’s latest speech from the throne and budget painted rural communities and resource development in few broad strokes, but Premier John Horgan followed it up by noting one important change coming to forestry rules in the province. Horgan says his government plans to restore appurtenancy rules that tie timber harvests to processing at local mills. The rules were eliminated by the BC Liberals in the early 2000s and devastated economies in forestry dependent communities in rural B.C., including Fort Nelson, as mills shut down and processing went elsewhere deemed more profitable. Restoring the rules is part of a move to “revitalize the forest industry’s social contract with British Columbians,” the government noted in its throne speech. By Canfor Pulp Products Inc.
VANCOUVER – Canfor Pulp Products Inc. today reported fourth quarter 2017 results and quarterly dividend. Record quarterly operating income of $67 million, surpassing previous high by more than $14 million. … Net income of $45 million, or $0.69 per share; $102 million, or $1.55 per share for 2017. …The Company reported record operating income of $66.8 million for the fourth quarter of 2017, an increase of $45.7 million from the $21.1 million reported for the third quarter of 2017, as the Company benefited from a sharp improvement in market conditions. VANCOUVER – Canfor Corporation today reported fourth quarter 2017 results. Q4, 2017 adjusted operating income of $190.8 million, aided by improved lumber unit sales realizations and record-high pulp and paper earnings; operating income of $598.5 million and record-high sales of $4.66 billion in 2017. Adjusted net income of $114.8 million, or $0.89 per share; $363.4 million, or $2.77 per share, for 2017. …The Company reported operating income of $214.2 million for the fourth quarter of 2017, up $108.8 million from reported operating income of $105.4 million for the third quarter of 2017, with the increase reflecting higher operating earnings for both the lumber and pulp and paper segments. OREGON — In what economists are calling a “slight rebound,” the Central Oregon wood-products industry could hire as many as 2,900 people to fill new positions and replace retiring workers over the next six years, according to the Oregon Employment Department. That could mean more jobs in Deschutes and Crook counties. …The wood-product manufacturing sector, which makes particle board, plywood and two-by-fours, is still a large industry in Oregon in terms of jobs and revenue, said Brian Rooney, an Employment Department regional labor economist. Roseburg Forest Products has named Ashlee Cribb as Vice President of Structural Products, with responsibility for the sales and manufacturing of Roseburg’s engineered wood products, softwood plywood and lumber businesses, company said in a statement. 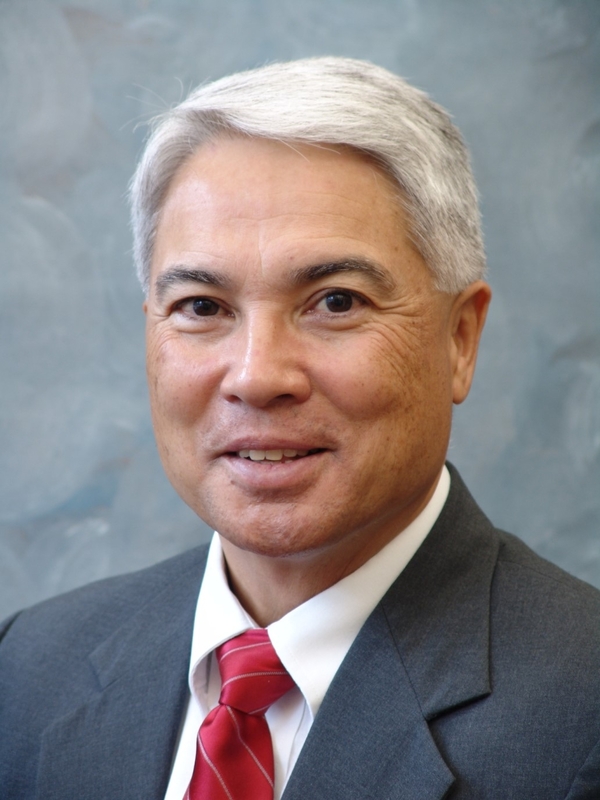 In a related move, Mark Avery, current Vice President of Roseburg’s Composites Business and Logistics, has been promoted to Senior Vice President of Industrial Products and National Accounts. …Cribb will be responsible for Roseburg’s structural wood products, including the engineered wood products plant currently being built in Chester, S.C. The new plant will complement Roseburg’s existing engineered wood plant in Riddle, Ore.
Taiwan toilet paper panic: why is island caught short? Taiwan retailers have seen a rush on toilet paper over the weekend, as word spread of an imminent sharp price rise. Shoppers used social media to post pictures of empty shelves where the product would usually be. Manufacturers have written to retailers warning that prices are set to rise by 10% to 30% next month, as extra costs are passed on to customers. …Forest fires in Canada and disruption to production in Brazil are among the factors being blamed. And as a result, the price of short fibre pulp, used to make toilet paper, now costs about $800 (£600) per tonne, compared with $650 a year ago, it said. But one of Taiwan’s largest toilet paper suppliers, YFY, says the situation is more drastic than that. It claims pulp costs have increased even faster than government estimates, soaring by about 50% since the middle of last year. Packing and transportation costs are also rising, it added. Prefabricated modular and mass timber construction can offer a number of advantages in northern or remote areas, including reducing the need to find skilled labour or paying higher labour costs, says Eric Karsh, a structural engineer and principal of Equilibrium Consulting, who is promoting a “plug and play” three-dimension-style unit construction. “Three-dimensional fabrication in that kind of location makes sense more than anywhere else because the labour costs are triple the cost here (Vancouver),” said Karsh. …The ability to prefabricate, use mass timbers, which provide a wood finish, plus use passive house standards all combine to provide the “best in plan” project that the client wanted, he said. “The building plan was originally for three storeys but it has been designed for a fourth storey,” said Karsh, adding the concept of using three-dimensional modular prefabricated units makes such structures conducive to expansion if needed. A petition urging McDonald’s Restaurant to move to 100 per cent biodegradable packaging has gained traction, collecting almost 26,000 signatures since its creation a week ago. However McDonald’s New Zealand say they already have a commitment to fully renewable, recyclable guest packaging for its New Zealand restaurants by 2025. …McDonald’s January statement reads: “By 2025, 100 percent of McDonald’s guest packaging will come from renewable, recycled, or certified sources with a preference for Forest Stewardship Council certification. Also by 2025, the company has set a goal to recycle guest packaging in 100 percent of McDonald’s restaurants,” a statement said. EDINBURGH — It’s 15 years since the launch of the Centre for Timber Engineering at Edinburgh Napier University. Our longest-running project, “Strategic Integrated Research in Timber”, is almost as old and still working hard, in close partnership with industry, to grow the use of timber through applied research, knowledge transfer, and standardisation work. So this might be a good excuse to look back, but instead I want to look forward. We’ve been calling wood “the material of the future”, but what is that future and how do we prepare for it? There are well-known environmental, economic and societal motivations for adopting a more sustainable, circular, bio-based economy. Wood, being renewable, is high on the list for replacing scarcer, less environmentally-friendly raw materials, but renewable doesn’t mean limitless. PRINCE GEORGE: The BC Council of Forest Industries (COFI) is launching its 2018 scholarship program and is seeking students entering post-secondary programs to apply. Ten $1,500 scholarships are awarded to students who are enrolled in professional, technical, or trades studies at specific Interior institutions with the goal of pursuing a career in the forest industry. “COFI is pleased to support the next generation of students as they pursue their education goals and learn about the forest industry of the future,” said Susan Yurkovich, president and CEO of COFI….For more information about eligible institutions and how to apply, download application here. Applications are due March 31, 2018. The Province’s Forest Inventory Program will be reviewed to ensure it accurately reflects the changed nature of British Columbia’s forests over the last few years, Forests, Lands, Natural Resource Operations and Rural Development Minister Doug Donaldson announced today. He made the announcement at the Association of B.C. Forest Professionals Conference. “We have a robust forest inventory program, but it’s been 10 years since the program was last reviewed, and since that time, we’ve seen significant changes to our forests, most notably from the mountain pine beetle epidemic and wildfires,” Donaldson said. “Having a reliable inventory is important to garner public trust in how we manage our public forests.” A five-member panel will be conducting the review and submit its report with recommendations, by Sept. 30, 2018. The UBC paper coauthored by Daniels, Gray and Burton about the 2017 mega-fires has an extensive section on integrated wildland-urban, interface-zoning and proactive landscape planning which is a good starting point for any community wanting to reduce the impact of wildfires. The introduction starts with relationships. In order to reduce the threat of wildfires, B.C. needs to develop a new relationship with rural communities, especially First Nations. It stresses that the primary land management objective in the vicinity of rural communities should be long-term maintenance of low fire hazard condition. 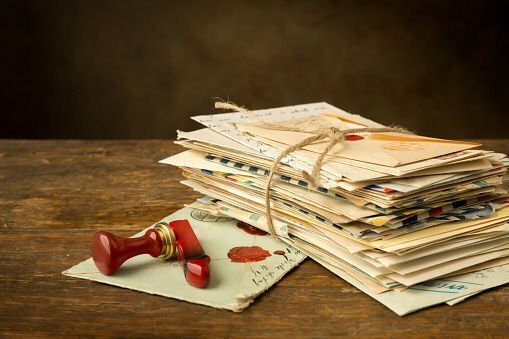 It then lists a number of existing policies that must be changed or abolished in the vicinity (in some cases as far out as 15 kilometres) of rural communities. The new Fundamentals of Forestry – Harvesting Practices program in Woss will now officially be offered tuition free for the first intake of students. …Prior to this announcement Western Forest Products committed to sponsoring six seats, but the remaining six seats for the program, which begins April 16, had not officially secured funding. “Several organizations including Western Forest Products, Mount Waddington Regional District and Vancouver Island North Training Attraction Society have provided funding to cover the tuition for the 12-week program in Woss,” explained Spence. Groups who may not see eye-to-eye on the issue of backcountry access in the Alberni Valley worked together to come up with solutions to alleviate conflict. Scott Fraser, Alberni-Pacific Rim MLA, hosted a private meeting today (Feb. 23) in Port Alberni bringing together forestry companies, local government representatives, mayors from around the Island, MLAs and community representatives. …Fraser said people are really feeling the pinch of being restricted to certain backcountry areas, something he described as the number one issue he’s heard over the past year or so. …During the private meeting, forest companies said access may be restricted because of vandalism, garbage dumping, wildfire concerns and guest safety concerns in areas of active logging. The Nova Scotia forest industry is hoping Tuesday’s federal budget will contain funding for a program that is attempting to halt the spread of a devastating pest to the province’s woodlands. A spruce budworm outbreak that started in New Brunswick in the late 1970s and early 1980s affected 1.2 million hectares of provincial woodland in Nova Scotia, decimating forests in the Cape Breton Highlands and beyond. A new outbreak, this time starting in northern Quebec and spreading south, is again threatening the industry. Rodney Maclean, owner of Antigonish-based R. Maclean Forestry, was working in the industry during the last spruce budworm outbreak and still remembers its devastating effects. The response to the outbreak at the time was to harvest all the trees impacted. Walking through a stand of hardwood, Kari Easthouse’s eyes work differently from yours or mine. A seam in a sugar maple’s bark warns of an old wound that, though long healed over, would mean deep brown staining in the wood beneath. Almost imperceptible dots in that same tree’s bark signify birdseye, a sought- after phenomenon amongst furniture makers that doubles the lumber’s value. …Two hardwood flooring manufacturers and a handful of sawmills have all closed, citing among the primary reasons their inability to gain access to Crown land to access hardwood species. The recently founded Breton Forest Innovation Co-op aims to raise Cape Breton’s hardwood industry from the ashes while focusing on private woodlot owners rather than Crown land. “Guysborough County harvester Danny George is accusing the Department of Natural Resources of allowing old-growth hardwood to be cut and burned in Nova Scotia Power’s biomass boiler at Point Tupper,” reports Aaron Beswick for the Chronicle Herald. Beswick gets into the details of that charge, and it’s worth reading the whole article. (As an aside, it’s good when Herald reporters are given the freedom to break from the usual inverted pyramid style reporting; Beswick is asking readers to take the time to explore the issue with him, and the result is both readable and informative.) Burning old-growth hardwood forests for biomass is, well, insane. It is the exact opposite of responsible forest management. FLAGSTAFF, ARIZ.—Thousands of acres of national forest land near Flagstaff could be transferred to the state under a proposed exchange as part of an effort to meet a federal commitment to the Hopi Tribe. In exchange for the federal land, the state would provide large tracts of land elsewhere in northern Arizona to the Hopi Tribe under a 1996 agreement approved by Congress to resolve a long-festering dispute with the Navajo Nation, the Arizona Daily Sun reported Sunday. The Flagstaff-area property includes acreage west of Walnut Canyon, and land near the Forest Highlands development. The office of Sen. John McCain and the Arizona State Land Department began preliminary discussions about an exchange at the request of the tribe last year. We’ve all heard the common claim that forests recover from fire, and, just as surely, that forests can recover from logging. Conservationists have stressed that point in arguing that fire is not the catastrophe some have believed, because forest comes back after fire. Logging lobbyists, meanwhile, have stressed much the same point in arguing that logging is not the catastrophe some have believed, because forests come back after logging. So, despite their well-known clashes, conservationists and the logging industry have both argued for a view that forests can indeed recover. …Yet for much of the world’s forests, the familiar day of resilience is done. Gone with it, too, the vacuous claim of sustainable logging, and gone with sustainable logging the many forest-dependent jobs and careers based on that premise. …To be clear, I’m not warning of a treeless planet, or, to take it down to my home state, a treeless Montana. A wildfire season that broke records last year offered a glimpse of what Central Oregonians can expect as fire seasons get warmer, drier and longer. A series of presentations in March led by a Washington-based expert on wildfire could provide additional clues. 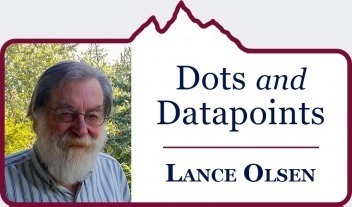 …The presentation, “Era of Megafire,” will discuss how Central Oregon’s ecosystem has changed to make it more susceptible to wildfires, and how it will continue to change going forward. “For anyone who spent a very smoky August, September, October here, I think that was really impressed upon us,” said Brad Chalfant, executive director of the Deschutes Land Trust. 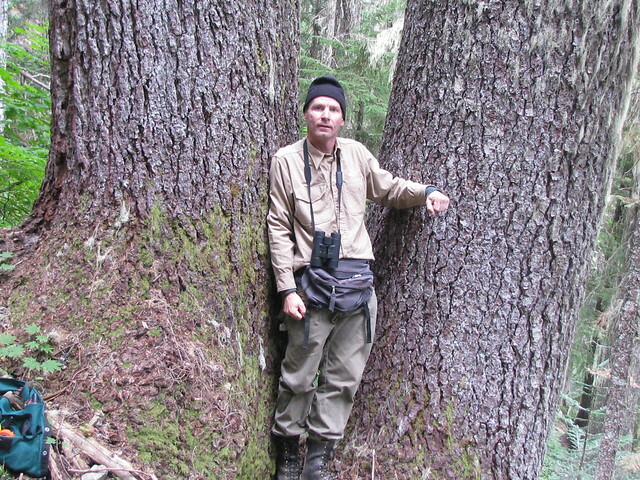 …The land trust reached out to Paul Hessburg, a research landscape ecologist with the U.S. Forest Service’s Pacific Northwest Research Station in Washington. EUGENE, Ore. – In its second day, the Oregon Logging Conference held it’s first ever “Future Forestry Workers Career Day.” At this event, high school students attended activities and exhibits designed to show them the positives of a career in forestry. Staff with the conference said the event came about because of a desperate need for younger workers in the industry. They said there are many positives to this career, including working outdoors, the logging community, and even the compensation. …More than 600 students from 22 different Oregon high schools signed up to attend the event. Many of them said they were feeling inspired to get involved in forestry after attending the event. Sen. Jon Tester’s Blackfoot Clearwater Stewardship Act and Sen. Steve Daines’ bill 2206 are nothing but giveaways to the timber industry at the expense of our clean water, wild places, and most importantly, our democracy. Tester is not following the democratic process when he allows only a chosen few, including Pyramid Lumber, in the collaborative group who wrote his bill. It is not a surprise the bill opens up tens of thousands of acres in the Lolo National Forest to timber sales. Also not surprising, the authors of the bill will be the only people who decide on those projects. The rest of the locals will be left out in the cold without the power to express their opinions about the lands they use and enjoy every day. 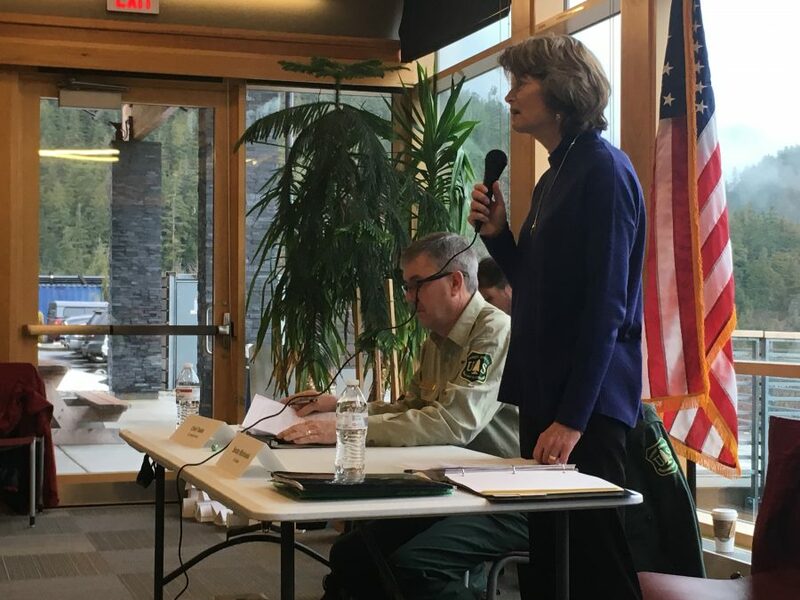 If one had to choose a theme for Sen. Lisa Murkowski’s roundtable discussions on the Tongass National Forest, it would be “Access.” Over and over, the senator and U.S. Forest Service Chief Tony Tooke heard panelists say they need more access to the forest. Through roads, through less-cumbersome permitting, through whatever means. They want access. It was a nearly three-hour discussion Friday at the Ketchikan public library. Below is a summary. …Another recurring theme for many panelists was the plan for transitioning to a young-growth timber industry. The Forest Service went through a long process to come up with a transition plan that calls for a complete switch in 15 years. Timber industry representatives have said, and continue to say that’s not feasible. Throughout my 40-plus year professional forester career serving in both the public and private spheres, I’ve come to view forestry as an “ideal” business sector. That’s because good forestry conserves the whole range of environmental, social and economic forest values. Sustainable forest management ensures that a forest’s soil, air and water quality, wildlife habitat and recreational values are protected over the long term. Sustainable forest management also provides well-paying jobs that strengthen communities through the sustainable production of timber and other forest products. In addition, the South Carolina Forestry Commission has taken a lead role in demonstrating sustainable forest management. Since 2013, the agency’s five state forests have been certified to the Sustainable Forestry Initiative Standard and the American Tree Farm System. Minister of State with responsibility for Forestry Andrew Doyle recently toured Galway to highlight the importance of the forest industry chain to the local and regional economy in the county. 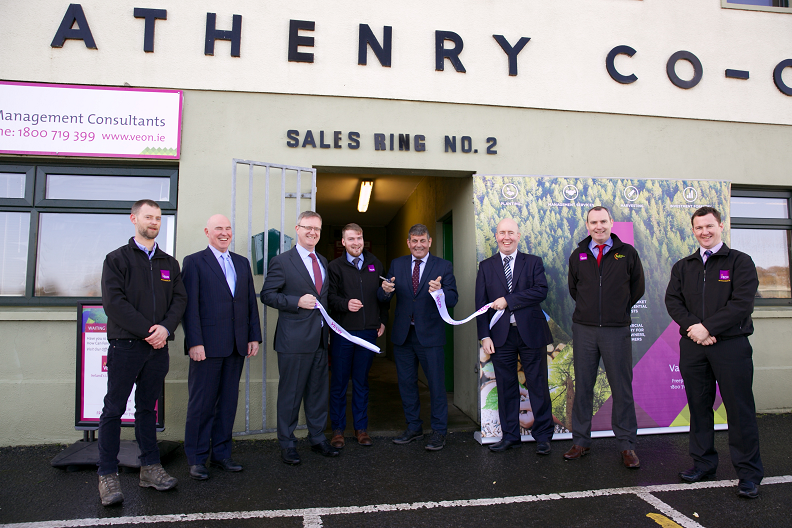 The minister placed special emphasis on the fact that all elements of the industry chain are present in Galway and are providing long-term sustainable employment in the county. …The Midterm Review has significantly increased payments under the scheme and he expects further uptake of the scheme from farmers in the Galway region in 2018. “With all the uncertainty surrounding Brexit, forestry has proved to be an extremely good choice for some farmers to pursue on the best-use-of-land basis. AUSTRALIA — The Andrews government has spent years investigating claims of unlawful logging against its state-owned timber company without enforcing any penalties. Documents reveal Victoria’s environment department is currently probing 27 alleged forest breaches against VicForests, …including multiple claims involving rainforests, where timber harvesting is prohibited. At least four of those cases relate to coupes in East Gippsland, where logging activities allegedly took place in or around rainforest areas without establishing protective buffers that are required under the Code of Practice for Timber Production. Although the Clean Energy Jobs bill’s alleged aim is the reduction of Oregon’s carbon emissions, it amazingly ignores the state’s largest emitter: industrial clear-cut logging on millions of acres of our forest lands. The Center for Sustainable Economy declared in its 2017 “Oregon Forest Carbon” report that “emissions of carbon from even-aged management, also referred to as clear-cut logging, is topping out at an average of 33 million metric tons of greenhouse gases each year (in Oregon). By comparison, the previous No. 1 — transportation — emits between 20 million and 24 million metric tons each year.” …At best, the Clean Energy Jobs bill is merely window-dressing that only seeks to increase revenues in the state’s coffers. PORTLAND, Maine — Beech trees are dominating the woodlands of the northeastern United States as the climate changes, and that could be bad news for the forests and people who work in them, according to a group of scientists. The scientists say the move toward beech-heavy forests is associated with higher temperatures and precipitation. They say their 30-year study, published in the peer-reviewed Journal of Applied Ecology, is one of the first to look at such broad changes over a long time period in the northeastern U.S. and southeastern Canada. 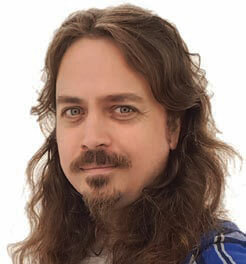 The changes could have major negative ramifications for forest ecosystems and industries that rely on them, said Dr. Aaron Weiskittel, a University of Maine associate professor of forest biometrics and modeling and one of the authors. The fuel was released from HMCS Calgary, a Halifax frigate, between 3 a.m. and 8 a.m. during a re-fueling operation, the Ministry of Environment said. “The spill was reported to have started near Parksville and ended approximately 100km southeast, just west of Tsawassen.” No sheen was observed, the ministry said in a statement online. Environment Canada has also determined there would “likely be no impact” to the shoreline. “Environment Canada calculations predicted a quick dispersion of the fuel due to sea conditions and the continuous movement of the vessel during the release.” Teams from the Department of National Defense will continue to searching the sea and shoreline for signs of fuel. The navy said it is co-ordinating with Environment Climate Change Canada, the Canadian Coast Guard, Transport Canada and B.C. Emergency Management and has launched an investigation to determine the cause of the spill. Two people are dead after their truck collided with a logging truck about 100 km south of Grande Prairie, Mounties said Friday. The crash happened at about 12:45 p.m. Thursday at the intersection of Canfor Road and Forestry Road. The 67-year-old driver of the truck and his 27-year-old passenger, both from the Edmonton area, died at the scene. A female passenger from Mundare was taken to hospital via air ambulance with serious injuries.